Create an enchanted butterfly garden with this handcrafted stoneware and recycled glass puddler. There's nothing quite like a garden aflutter with wild butterflies in the afternoon sun. 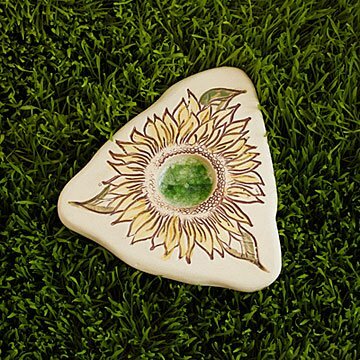 Attract your neighborhood beauties with this cheerful sunflower puddler, designed to hold onto natural minerals after water evaporates. Its shallow well of recycled glass holds sand or rock salt along with a teaspoon of water. When the water evaporates (in under a day), butterflies are attracted to the minerals left behind from the hard water and sand/salt. Once butterflies know where they can find these minerals, they return regularly. Place it in a conspicuous nook to transform your outdoor space into an enchanted garden. Designed by Jo-Anne and Gerald Warren. Handmade of stoneware and recycled glass in Canada. Approx. 8.5" L x 8.5" W, 3 lbs. 6 oz. To attract butterflies to your garden, place the butterfly puddler in a sunny, protected place. Fill the well with sand, and then cover with water. Butterflies crave the minerals & salts left behind as the water evaporates. Refill with water when needed. You can also place overripe fruit on the puddler, or add a pinch of salt to the water to attract the butterflies. Comes with sand and instructions for use. Will not crack in the snow or fade in the sun. I loved it so much I see myself treating myself to one for my garden! I'd buy the fern one I originally saw for me, though, as it fits my garden better. Pretty and adds character to the flower bed. I haven't attracted any butterflies yet so will try to place in a different part of the yard. I recomend the sunflower Butterfly Puddler. I placed it on an outdoor table near blooming plants. Love watching them stop to sip. My mother's garden is literally the talk of her neighborhood, as hers is chosen to be the show garden during the annual garden walk. She expresses her artistry and creativity through plants, and this kind of small but useful and pretty accent is perfect for her. We have never had a puddler before and have not had the chance to set this one up yet. (Father's Day gift.) We have tons of wildlife in our backyard, except for butterflies, so excited to set this up soon! I really love this !!! I love butterflies. I have already seen butterflies around this product. Can't wait for more flowers to be in bloom. We usually have lots of butterflies in our yard. Easily set up and maintained.. just the perfect gift for someone who wants to attract oodles of beautiful butterflies. This will be a great addition to her garden, there's a sunny spot that it will be perfect for.